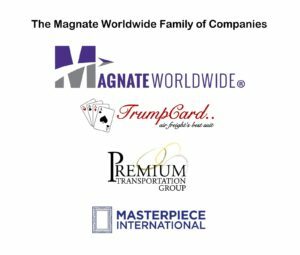 OAKBROOK TERRACE, Ill., March 30, 2018 /PRNewswire/ — Magnate Worldwide (“MWW”) and its family of premium transportation and logistics companies are happy to announce redesigns of the TrumpCard, Premium Transportation Logistics (“PTL”), and Masterpiece International (“Masterpiece”) websites. The new designs are outfitted with improved navigation to help clients, partners, and staff quickly reach the material they are looking for; offer more information about the companies’ full range of services and industry verticals; easy access to shipment tracking features; and provide portals for secure document transfers. The revamped websites include mobile-friendly versions for visitors accessing through phones and tablets, and quick contact information for each of the companies’ division and locations. For easy access to all of the MWW brands, the footers at the bottom of each of the website connect visitors to each of the sister companies’ homepages. As Magnate Worldwide continue to grow, updates and information will be published on a ‘News’ section of each site. “We are enthusiastic about all of our services offerings and industry verticals being on display, and happy to provide users with improved functionality. The added features will allow our web visitors to have a very informative experience as we continue to grow and increase our market presence,” said Masterpiece International President, Thomas Gilgen. Visitors are encouraged to explore all of the Magnate Worldwide Family websites, which can be found below in the descriptions. Since 1995, TrumpCard has provided expedited air freight and ground solutions to customers around the United States, Mexico, and Canada. The company’s cornerstone is its exceptional customer service and proprietary technology that allow customers with high-value and sensitive freight to have dedicated teams watching shipments all over the continent. Find out more at www.trumpcardinc.com. Founded in 2002, Premium Transportation Logistics provides premier ground transportation and logistics services to the North American market. The company provides customer-focused transportation solutions to a wide range of industries – exceeding expectations with superior customer service, competitive pricing, technology, and on-time service. Learn more at www.shipPTL.com.